The last days of Oscar Wilde -- and the ghosts that haunted them -- are vividly evoked in Rupert Everett's directorial debut. Everett gives a career defining performance as Wilde, physically and emotionally embodying the literary genius. 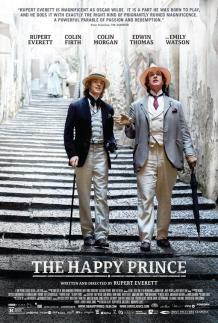 Aside from flashbacks to happier times, the focus of The Happy Prince is on Wilde’s final years, following his conviction of ‘gross indecency’ for homosexuality and two-year prison term. Impoverished, he goes into exile in France with only occasional contact with old friends Reggie Turner (Colin Firth) and Robbie Ross (Edwin Thomas), and his wife (Emily Watson) and two sons far away. Desperately lonely, he forms a surrogate family in Parisian prostitute Jean and his brother, anaesthetising himself with booze, cocaine and young men. As the film travels through Wilde's final act and journeys through England, France and Italy, desire and loyalty face off, the transience of lust is laid bare, and the true riches of love are revealed. “It’s a melancholy film, punctuated with flashes of that famous wit and the heartbreak of the fairy tale from which it takes its name. Colin Morgan’s Bosie, the gorgeous, callous aristocrat who led to Wilde’s downfall, provides a welcome shot of venom when he returns to his side.